As you may know, contemporary dance is a very wide and heterogeneous form of art. This makes that the type of companies that exist in the world nowadays are of very different kinds. Also, there's not an institutional standardization of them, in such a way that you could determine if it is common for all to admit staff at a certain age. Therefore, depending on the company you aim to be part of, the age to start will vary. Usually, the minimum age to work professionally for dance will be close to 18 to 21 years old. But, there are choreographers and specific artistic projects that need mature dancers, which will want you to dance until the end of your life. Remember Kazuo Ohno, for example, who danced almost until his dead at the age of 104 years old, and still was broadly acclaimed? So, don't forget that contemporary dance creative possibilities go really further than the only acrobatic possibilities of dance. There is an immense field of expressive needs in our art that will welcome you as a performer regardless of your specific age. 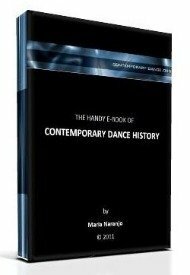 You could browse over our contemporary dance history page to widen your understanding of those possibilities. We also have a page where a young dancer asked a question related to yours. I believe the answer might be of your interest. You can find it here: Too late? (to succeed professionally in the dance world. And don't hesitate to visit us back and ask further questions if you need.